FM200 Automatic Fire Extinguishing System for Workover Rig of Offshore Platform ZHOU Hongjun;DENG Zhongbin;LI Hao;LUO Xiaochang;CNOOC Ener Tech Equipment Technology Co.
Effect of Sb Modifier on Microstructure and Mechanical Property of ZL101 Alloy HU Zhongchao;CUI Yuansheng;WANG Zhenling;YU Yucheng;LIZHONG GROUP Tianjin Nanuo Machinery Manufacturing Co.
Development of a Household Refuse Crusher Machine WANG Zhenhai;FU Lei;AI Hongchao;HE Peizhen;SUN Xicai;Tianjin Baili Sun Environmental Protection Equipment Co. Application of Urea Denitration Technology in Waste Incineration Power Plants YAN Zhihai;CHAI Bin;WEI Shaohua;HAN Xuejie;Tianjin Bohai Environmental Protection Engineering Co. Correlation of Total Phosphorus,Total Nitrogen,Dissolved Oxygen with Algae Counts in Erwangzhuang Reservoir WANG Cui;JIANG Xin;LIU Jia;Tianjin TEDA Water Co. Application and Prospect of Screw Conveyor in Solid Waste Disposal CHAI Bin;YAN Zhihai;WEI Shaohua;GE Yan;TANG Bin;Tianjin Bohai Environmental Protection Engineering Co.
Magnesium Oxide Desulfurization Process and Influencing Factors for Desulfurization Degree LI Ran;DUAN Junni;LI Fang;LI Shigang;TEDA Energy Development Co.
Research of Dynamic Multidimensional Torque Transmission CHEN Chunxiang;Tianjin Macro Technology Co. Reasonably Increasing Urban Greening Quantity to Improve Urban Ecological Benefits LIU Guiru;Tianjin TEDA Greening Group Co. 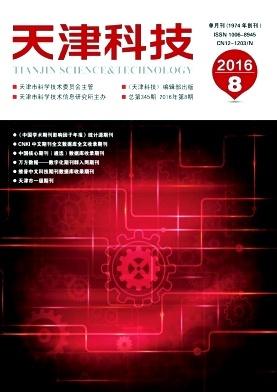 Analysis of HZ1080MB/AZ26-700 Combination Steel Pile Construction Technique FU Xiaolin;No.2 Engineering Co.
Repair of Wind Blades Damaged by Lightning Stroke XIE Liguo;YU Xu;LIU Weibing;Tianjin Dongqi Wind Turbine Blade Engineering Co. Analysis on Thermal Protection Miss-operation Caused by Imperfect Earthing of Generator LI Guoxiang;MENG Jinfeng;China Petrochemical Co.
A Study of Pranlukast Synthesis XU Haijiang;DING Maoshu;LI Weilu;ZHENG Xu;BAI Yushuang;XIE Bo;SU Hongyan;LIU Wushan;MEI Kaizhong;Tianjin Meihua Pharmaceutical Co.
Study and Realization of Algorithm of Path Recognition and Turn System for Smart Car TANG Baolong;FAW Toyota Research & Development Co.
Design of Academic Research Information Rapid Generating System Based on Project Archives LIU Nian;ZHANG Luji;ZHAO Yanyan;CHEN Mo;Beijing Electronic Science and Technology Institute;Beijing Institute of Science and Technology Information;Datang Telecom Technology Co.